Thomas Rhett takes #1 away from Luke Bryan by less than 20 track sales. See the chart here! It wasn't by all that much (and looks like a tie on our chart) but Luke Bryan did indeed lose #1 to Thomas Rhett this week as "Die A Happy Man" holds down #1 after debuting at #2 two weeks ago and holding fort there yet again last week behind "Strip It Down." Sitting at #3 for another week is Cam's nearly Gold single "Burning House" (it may have already been certified Gold for sales and streaming). The only new song in this week's Top 10, let alone Top 5 is Sam Hunt's "Break Up In A Small Town." That single has now moved 483k to date and is already certified Gold and well on its way to Platinum. Rounding out the Top 5 is Keith Urban's latest chart-topper (Country Air Check/Mediabase) "John Cougar, John Deere, John 3:16." He's now sold 527k downloads. At #6 is Old Dominion with their nearly-Gold single "Break Up With Him" The single is off of their soon to hit stores album Meat And Candy. Down to #7 is Carrie Underwood's "Smoke Break." The single has now surpassed 202k downloads to date. At #8 is Chris Janson's "Buy Me A Boat." The single has scanned 740k to date. Chris Young's Gold-certified "I'm Comin' Over" is at #9 with 405k scanned to date while Sam Hunt's "House Party," a song which has scanned 865k to date, and is already certified Platinum. 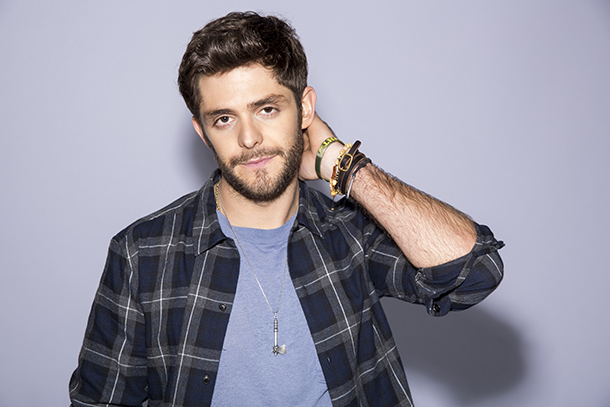 Thomas Rhett's "Crash and Burn" re-enters the Top 30 at #11 after falling off due to Tangled Up pre-order sale fulfillments last week (that were counted months ago). This week's radio #1, Brett Eldredge's "Lose My Mind" is at #12 with 377k to date and likely will eventually be certified Gold (if it hasn't been already thanks to sales+streaming numbers). Brothers Osborne are at 235k to date while Eric Church is 3-4 weeks away from 1,000,000 downloads for "Like A Wrecking Ball." Maddie & Tae's latest hit, "Fly" is at #18 this week with 281k downloads while The Band Perry's "Live Forever," Josh Abbot Band's "Amnesia" and Randy Houser's "We Went" all re-enter the Top 30 downloads this week. Charles Kelley "The Driver" debuts at #33 with 6,300k scanned to date. Rascal Flatts "I Like The Sound Of That" at #82 with 16k to date. Tim McGraw "Top Of The World"
Thomas Rhett/Jordin Sparks "Playing With Fire"
Nashville Cast "Wake Me Up When It's Over"